The tenth episode of AMC’s The Terror brought the outstanding series to a close Monday, but Russell Potter and Stephen Smith aren’t done yet yet. Here, Canadian Geographic’s two reviewers weigh in on everything from their favourite characters in the series to what the show adds to the historical and fictional legacy of the Franklin Expedition. Who was the standout character for you in the series and why? Russell Potter: There’s no question in my mind that Francis Crozier is the most richly realized and engaging character in the series. Jared Harris’s performance brought him fully to life, and — as Harris has done with other historical figures — gives him a presence, an immediacy, that drew me deeper and deeper into its magnetic field each time I watched. His character arc was also the most dramatic, bringing him from rejection, despondency and drunkenness into the kind of self-awareness and dignity of deportment that evokes all the best a man of that era could embody. We ourselves seem such smaller people in comparison, though our technology makes us feel large. In a way, it’s the defeat of technology that is the central parable of the show, and Crozier is the one figure who understands this. Stephen Smith: Yes, for me it’s Crozier, too. Jared Harris’ performance as the Terror’s flawed and yet entirely venerable captain is masterly. His transformation has been fascinating to watch week by week. 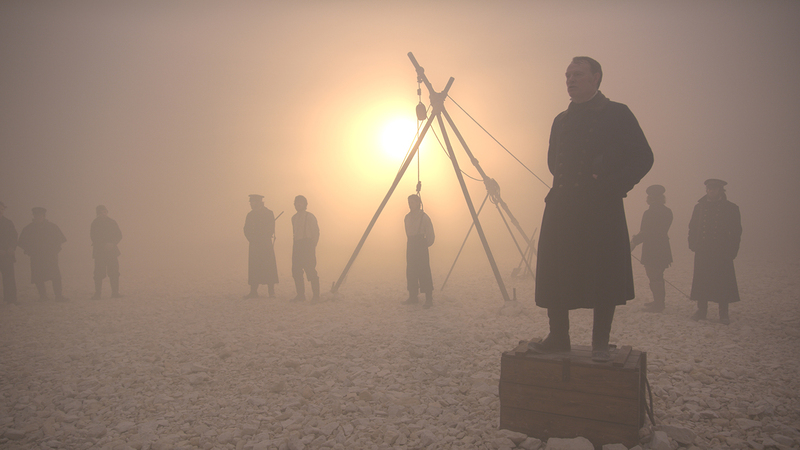 The Terror is in so many ways a bleak reflection on human nature and endeavour; Crozier’s self-possession through it all makes this a story that’s also, somehow, still, uplifting. What was the standout scene for you in the series and why? Russell: There are so many, it’s hard to pick just one, but if pressed, I would have to say it’s Paul Ready’s early scene as Goodsir, tending the young crewman David Young (played by Alfie Kingsnorth). Long before the worst has come, we see the complex compassion in Goodsir’s eyes, and the utter fear of death in Young’s. His death and burial also vividly evokes that of John Torrington on Beechey Island, though in the show’s timeline that’s the previous winter. Stephen: I’m the same, finding it hard to pick one. I would note that it’s not just busy, bloody action scenes that come to mind — in several of The Terror’s most dramatic and affecting scenes, the principals are sitting around tables or tents, simply … talking. A scene from this week’s final chapter I did find particularly poignant was the one in which Crozier and Silna wander through the final, fatal camps of Lieutenant Little and his stragglers. The corpses and evidence of cannibalism are ghastly enough, of course; the sight of all those abandoned books, pages blowing in the northern wind, struck its own distressing note of final abandonment. The Terror is based on the novel of the same name by Dan Simmons. Now that the series is finished, which do you feel is better: the book or its dramatization? Russell: Well, it feels a little unfair to compare any book with a well-realized television or film version — they’re such different animals. That said, I think the show improved on the book in some very striking ways, particularly in sending Tuunbaq on a longer hiatus, and giving other natural forces — disease, cold, exhaustion, and madness — more time to occupy the centre of the narrative. I also feel that the series’ attentiveness to the authenticity of Inuit roles and culture improves considerably on what the novel gives us; it gets much closer to the real thing. Stephen: There’s so much you can do with cameras and superior scripts, a meticulous production design, a first-rate cast, and The Terror we’ve been watching certainly seems to do it all. Then again, Tuunbaq’s abrupt end as we saw it onscreen did bring me up short. The novel’s version of the monster’s whys and wherefores and — especially — his exit does, to my mind, make better sense. Crozier’s survival gets a much more detailed treatment there, too, including (spoiler alert) family life with Silna and a return to the decks of HMS Terror. You both know the Franklin Expedition story very well, and you both enjoyed the series. With those things in mind, and acknowledging that the series is based on a work of fiction, which person or incident from the “real” history of the expedition (or as much as is known about it) would you have wanted to see represented in the show that wasn’t? Russell: So much of the “real” story is yet unknown, the stuff of conjecture and uncertainty — which is part of the pleasure of seeing it imagined! — but I suppose if I’d had my druthers I would have had a bit more, and longer bits of backstory for Franklin, Crozier and the other key figures. I’m in the process of editing a book of the men’s letters home (and their families’ letters to them), and discovering, in the process, all the little private observations each man made, how they set up their cabins, the hopes they had — it would have been nice to show some of those scenes, and perhaps hear the actors read some excerpts from their letters. Stephen: As mentioned, I’m in favour of more of everything. A second season taking up with John Rae and Charles Francis Hall and the rest of the searchers? Sign me up. What about a prequelling third that follows Franklin on his first imperfect Canadian foray? I’m in. Where does The Terror rank in the Franklin Expedition canon? Russell: Ah, now there’s a question. Limiting ourselves just to Franklin-inspired fictional narratives, I’d have to place it near the very top. So many writers have tried to imagine the expedition’s unknown progress toward disaster — from Charles Dickens and Wilkie Collins (their play, The Frozen Deep, is almost unreadable today) to Jules Verne (The Adventures of Captain Hatteras), Mordecai Richler (Solomon Gursky was Here), Sten Nadolny (The Discovery of Slowness), or Dominique Fortier (On the Proper Use of Stars) — each with its peculiar twist, and the twist of the tastes of its era. So in looking back on the 10 episodes of The Terror, I would have to say that, while future generations (if any) may come to feel differently, I feel that it’s the finest treatment of the story I know, particularly for times like these.